On the Contributors Page of the current House Beautiful, I mention that one of my current obsessions is Italian trompe l'oeil ceramics. In fact, I've been obsessed with Italian ceramics, both of the trompe l'oeil variety and not, for years now, and my passion for it has yet to abate. (And I hope it never will, either!) I will be the first to admit that whimsical Italian ceramics can be an acquired taste. A lot of people just don't get it and even find it to be ugly. But if you do get it and it captures your fancy, then you will become mad for it. At least, that's been my experience. I was first introduced to Italian trompe l'oeil ceramicware when I worked at Tiffany. Back in the 1960s, the great Van Day Truex introduced a line of ceramic tableware decorated with trompe l'oeil fruits, vegetables, and legumes, all of which was produced in Italy. While some of these plates are still being sold at Tiffany today, much of it has unfortunately been discontinued. I started collecting these pieces around eight years ago after seeing my friend Kappy's enviable collection, and now I own roughly twenty trompe l'oeil pieces- and I'm not done collecting it, either. You can see part of my collection in the photo at top. I have to say that the plates are amazingly realistic looking, with the exception of those with carrots and strawberries. For some reason, the Italian ceramicists seemed to have trouble with those two. In addition to the trompe l'oeil plates, I also love Italian ceramic tureens, garden seats, lettuceware, and, well, I'll put a lid on it because I could go on and on. But I'm not the only person who is taken with this type of ceramicware. Mid-century Italian ceramic tureens are hot sellers at my friend Barry Hutner's antiques shop, Parc Monceau. Bergdorf Goodman installed all kinds of wonderful ceramic tableware and accessories in one of their 7th floor galleries, a charming way to usher in the summer season. And rumor has it that the Italian ceramic swan tureen that alighted on Christopher Spitzmiller's Lenox Hill Neighborhood House Spring Benefit table elicited many queries of "How much will you take for it?" By the way, it's not for sale, and if I owned it, I wouldn't part with it either! This tureen, part of my collection, is meant to look like a stack of plates with chocolates on top. The egg plate really does look peeled hard-boiled eggs. A plate of green beans and a pear on a plate. This trompe l'oeil piece, one that depicts a bunch of asparagus, is a cigarette box from the 1960s. 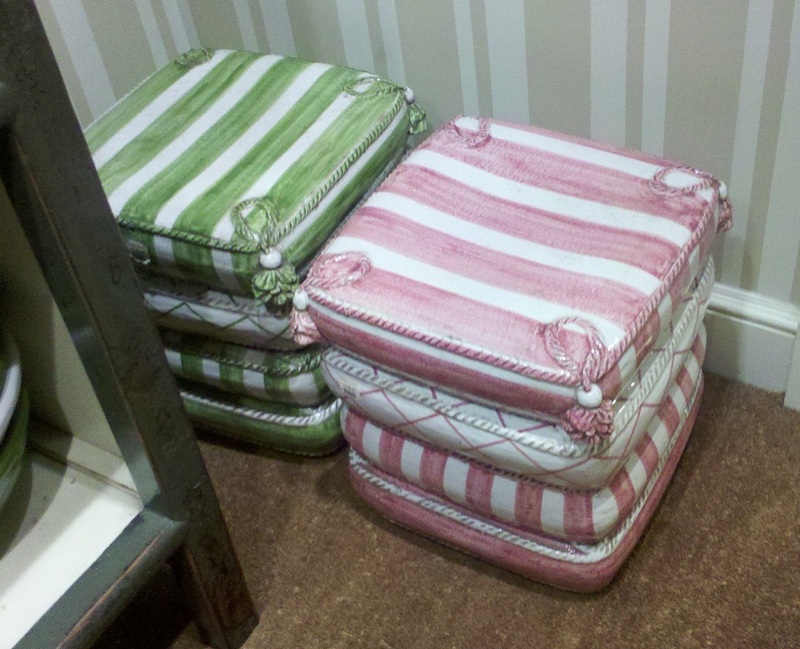 A pair of Italian ceramic garden stools graced the 7th floor of Bergdorf's this Spring. I wonder if they're still there? 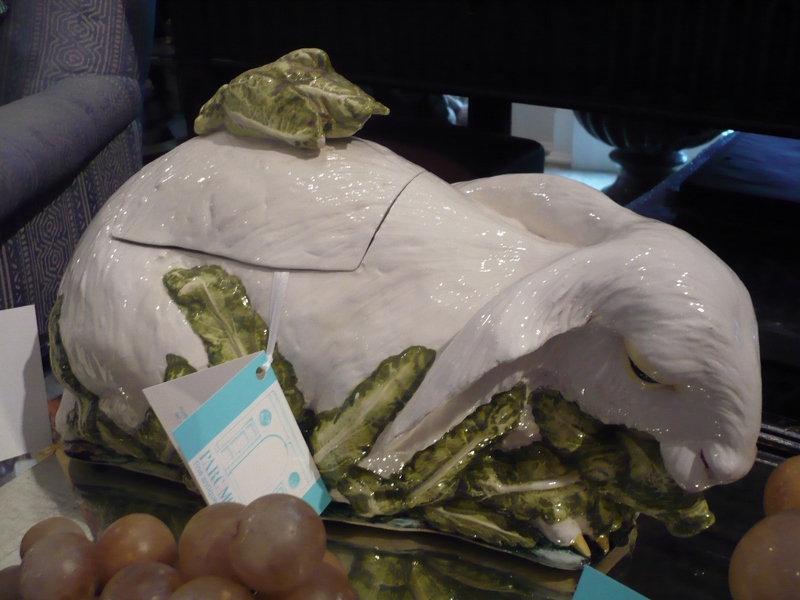 A shell tureen and a rabbit version, both mid-century Italian, are currently available at Parc Monceau. 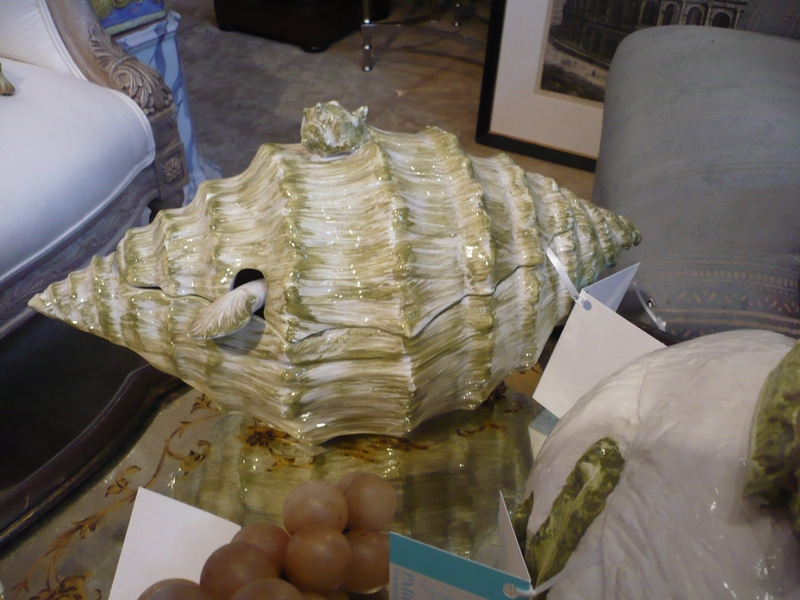 Christopher Spitzmiller's Lenox Hill table with the highly coveted mid-century Swan tureen. All photos by Jennifer Boles for The Peak of Chic, with the exception of the Spitzmiller table photo by Roberto Ricci and Marco Ricca. Jennifer, adore!! The Garden seats, the asparagus case and the shell tureen are favorites!! Thank you so much for sharing! 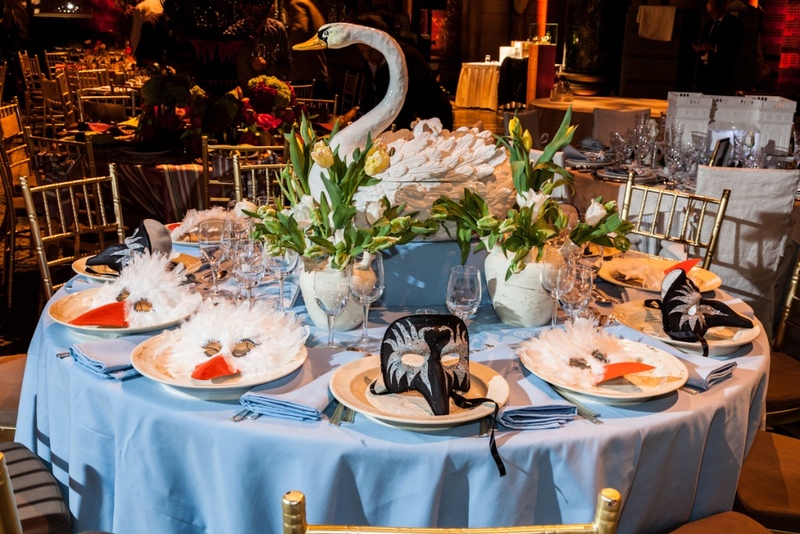 I like them all, but that swan is truly exceptional! Just saw this....my mom just broke that egg plate after having it hanging in the kitchen for 30+ years...where did you find it? Inwouldmlove to get another one...she thinks she got it in Tiffany's. Thanks. dear peak of chic, your article is absolutely fantastic. being italian, i share your passion for Italian trompe l'oeil ceramics! thank you for sharing this on your blog! A fabulous collection, Jennifer. I especially love the pea pods. I love trompe l'oeil--ceramics, paintings, furniture. The whimsy and humor make me happy. thanks. I bought two of Tiffany's green olives in a white weave basket eons ago, and gave one away to a friend. I did always rather enjoy offering an "olive" to guests with their cocktail. But I was young. The ceramic has long since been packed away in storage. I should go and look for it and put it out on an end table. I have collected trompe L'oeil ceramics for 25 years... ever since I received my first plate of Chestnuts ( Ester for Tiffany & Co.)as a Christmas gift. I have always preferred the vegetables, fruits, cheeses or baked goods on white scalloped plates, eschewing any with fish, crustaceans, fowl or meats. My personal opinion is that Italians and French have a style of decoration which displays a more painterly, fluid freshness of application which is not staid, overwrought, or slavish to detail which imparts a charm and je ne se quois. Over the years I have expanded my search and collections beyond Este of Italy, Christine Viennet, Bondil & Segries of Moustier, France to examples of Saugerremes, & Luneville, and Czech mfgs. Jack, It sounds like you have an impressive collection of trompe l'oeil ceramics. Can you recommend any books on the subject? I'd like to learn more about antique trompe l'oeil pieces.